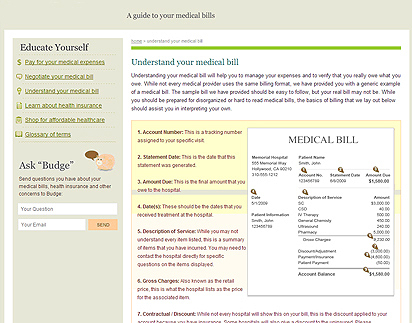 Carebudget provide the facility for the user that that can manage the monthly expense for the medical bills. They can save and reduce the monthly expenditure of the medical bills. 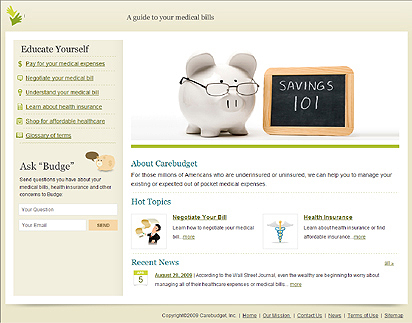 Carebudget is online application that helps the average American to manage his or her own medical expenses. The website provides lot of information to end user related to health care insurance. Also it helps people to choose best insurance option for their healthcare policy. Care Budget is for those millions of Americans who are underinsured or uninsured, we can help you to manage your existing or expected out of pocket medical expenses. To provide you with information to better prepare yourself for current or future healthcare expenses. Help you to plan in order to minimize any healthcare costs that you might face in the future. If you already have existing medical expenses, we would like to assist you in navigating the complex world of healthcare billing. Finally, provide you with options to help you to pay for your existing medical debt. On home page, user get information about Carebudget, hot topics, user can navigate to other links on ‘educate yourself’ from left panel at home page. On home page user can recent updated news.